Looking at today’s Card of the Day at first glance, it’s easy to dismiss her. Three skills? At six cost? Cunning is pretty good, but not six cost good. First off, three skills may not seem all that great, but two of them are naturally doubled. They won’t exactly open up mission selection for you, but it will absolutely crush some dilemmas out there. Being able to produce these naturally without any other cost or resource will be very useful against several dilemmas out there. On top of that, she boasts the rare Intelligence, which again won’t bust open some mission opportunities, but will pay off when it comes to a particular strain of dilemmas. Not a mission solver, but a dilemma buster although that cost of six is still pushing it. For that, you can play yourself a ship! That’s where her game text comes in. You save yourself a counter for each Treachery you command. They just have to be in play, you don’t have to park them at your headquarters. I know I’ve been on the wrong end of Aid Legendary Civilization enough to know that a discount personnel can be a sign from above. So what deck should she go into? With that Voyager icon, she will ironically get the most mileage in a Equinox deck. She technically doesn’t say that she plays for free, but you really don’t want to spend anything when you play her. She’ll also find a home with a Revised deck; they’re usually naturally chock full of treachery. Her affiliation icon can play out in a couple ways. The first, more obvious, way is to put her in a Cardassian deck and call it a day. Her skills are a little more duplicated in that situation, but they certainly have enough Treachery so that you can sleep soundly knowing that you can play her for free. Or, you could go the sneakier route and put her in your otherwise Federation deck above and include Abrasive Allies. You’ll get crushed by Terok Nor, Deep Space Nine, or anyone playing shenanigans. But against otherwise straight decks, you’ll get the stop. Hot on the heels of Hard Time there’s another simple personnel with a lot going on. She fits into several deck types and while not an auto-include, she can enhance your deck, supporting what you have in place and helping you as you move forward. Her cost is easily mitigated and having a personnel with a nominal cost of six has its uses. Thank you for sticking your Face in front of the computer and enjoy the rest of your day. You’ve seen Facebook, right? He’s kind of the opposite of Seska, requiring a Treachery but being a low cost personnel. Attributes are entirely yawn able, but those skills are great! Nothing really amazing brought to the table, but he will have uses busting through dilemmas and missions with his five. If you have the Treachery in your deck anyway, and with Seska, you probably have it in your deck. That command icon can have its use too, especially with Seska boasting a matching one. These two belong in their decks together. Not just that, but these two will probably be not matching the species of the rest of your personnel. 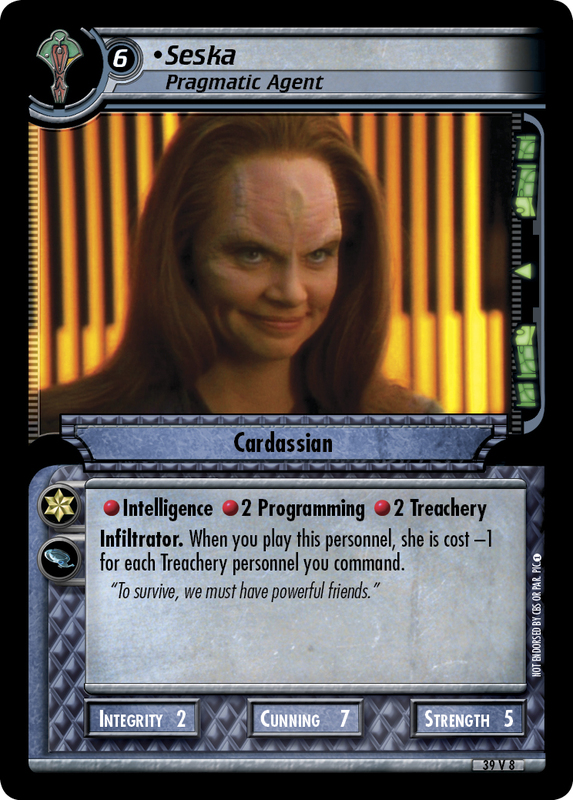 Well, Seska probably will in a Cardassian deck, but in those Voyager decks, she’ll help you through Intimidation.